Looking to get back in shape in 2019? Here are 3 expert tips from Cameron personal trainers to get the best results in the gym. Looking to join a fitness club in Cameron, NC? Be conscious that you don’t unintentionally end up doing and expecting things that are not reasonable. When we are kids, we are not really taught how we can keep ourselves healthy as we age. Nor do we really care like most kids at that age. Let’s face it, gym class or physical education didn’t really prepare us for a healthy and fit lifestyle. At in Cameron, we recommend establishing and building a family culture of health, wellness and fitness with your kids from the earliest of ages. Feel free to read these tips to keep your child healthy and help him/her realize the importance of a healthy lifestyle from a young age. A few of the personal trainers at Fit4Life Health Clubs in Cameron, NC, were asked what are the most common mistakes they see people making at the gym. We had opinions and insight from some of the most qualified personal trainers in Cameron, and all of them had no problem communicating the mistakes they typically see from people starting a new fitness regimen. 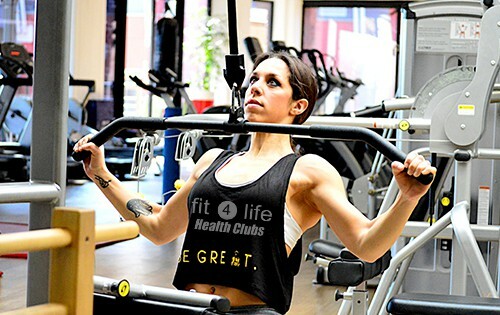 Here are three common mistakes that the personal trainers at the Fit4Life Health Clubs in Cameron find with people who are just beginning their health and fitness endeavor or for those who have been away from the gym for many years. As is quite normal, the first few sessions at the gym get us super-motivated and excited. We have heard the maxim that there is no gain without pain, and the tendency is to go all out with the excitement of getting back in shape. Training to the point where your muscles fail is not an ideal situation in your first month or two. A study on NCBI concluded that training to failure is not ideal or necessary for maximizing your strength or achieving hypertrophy. Consider that the more times you work a muscle group in a week the more chance you give it for protein synthesis, which in layman terms translates to MORE GAINS. Start slow and aim for consistency in getting to the gym weekly. If you go all out to early, you can easily end up injuring yourself. Patience is something that all humans struggle with. We crave instant gratification. Whether it is about earning money or gaining muscle, we can be prone to being impatient. Most beginners at the gym believe that a few months is all they need to get into their ideal body shape but the reality is there are no shortcuts to gains and no magic pills to get fit. When it comes to a healthy lifestyle it’s always about quality vs. quantity. A 90 minute cardio session might pale in comparison to a 20 minute HIIT session. Yes cardio helps in burning fat. But there are other methods too, that are equally, if not more effective than a 30 minute run on one of the state of the art treadmills at the Fit4Life Health Clubs in Cameron NC. Getting a qualified personal trainer is particularly important when you start gym for the first time. Cardio should definitely be a part of your fitness plan but adding muscle through a simple but comprehensive workout with a Fit4Life personal trainer will help you shed fat much faster than trying to do it on your own. There are a lot of myths and misconceptions in the fitness and diet industries that can be misleading or downright wrong when it comes to the real science of losing weight and getting fit. Stop in at the best gym in Cameron NC and ask to sit down with one of our qualified personal trainers to get your health, wellness and fitness back on track in 2019!